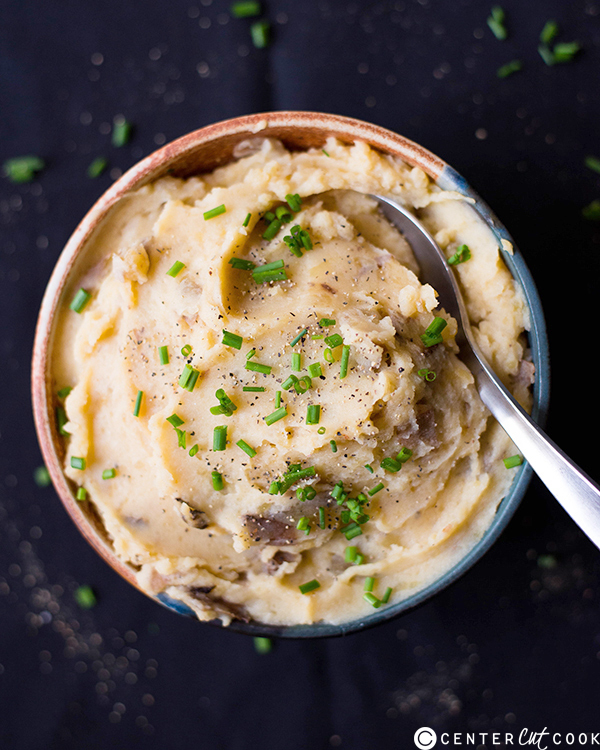 These slow cooker mashed potatoes are not only easy and delicious, they’re actually healthy, too! Problem, though, is they also very often contain loads of cheese, butter, fats, and salts. As much as I love love love mashed potatoes, they usually fall under the “cheat day only” kinda food. 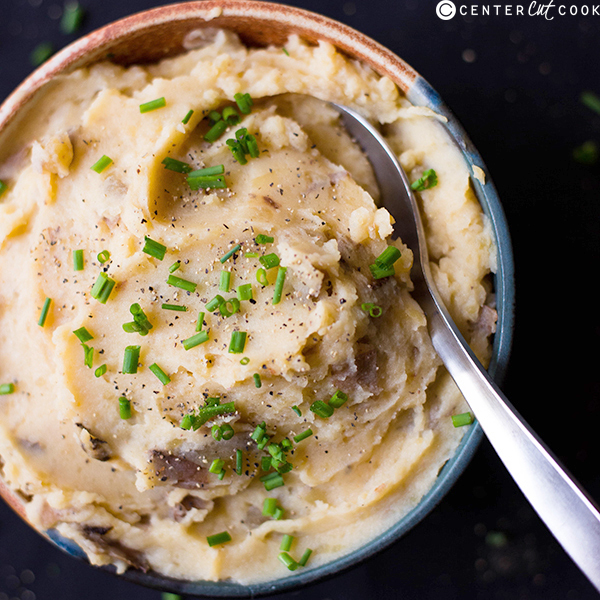 I found a way to make delicious, smooth, creamy, buttery – even – slow cooker mashed potatoes that contain (gasp) no butter at all. To make these mashed potatoes healthier, I used just a touch of parmesan and kosher salt for savoriness. I also used plain greek yogurt which makes the mashed potatoes a little tangy and creamy and super delicious. Plus, it adds protein, calcium, and all sorts of other goodness (sorry, butter). To say this recipe is easy is a complete understatement. This is just about as easy as slow cooker recipe can get. Just add the ingredients, let cook, and then mash. So, next time you have that craving for some rich and creamy mashed potatoes, now you can make your own and not cheat at all! A word on the potato peel. Personally, I like adding in the peel. Not only does this make prep easier because peeling potatoes is like no fun at all, but it also gives the potatoes some texture and makes them more rustic-like. If, however, you’d rather them not contain any peel, just peel before you slice into quarters and add into the slow cooker. Place the potatoes, almond milk, stock, and garlic in a slow cooker. Cover and cook for 3-4 hours on high or 6-8 hours on low. When the potatoes are very tender, mash directly in the bowl of the slow cooker to your desired consistency. Stir in the plain greek yogurt, parmesan, and kosher salt. Taste and adjust seasoning, if desired.